I have always had a strong appreciation for the imaginative and unique.Whatever the field, originality will capture my attention every time. This is something that is illustrated in the diversity of my choice in art where each piece of work has at one time captured my eye for a myriad of reasons. In the case of Claudio Viscardi, his striking paintings expertly draw the viewer in to his enticingly surreal world and urge you to look and look again. One does not need to be an expert or an art critic to appreciate the clever juxtaposition of nature and architecture in Claudio's world, both beautiful, both dramatic and fused together with a technical skill that makes them so desirable. As an Irishman, it is satisfying to know that the natural landscape of the Beara Peninsula, which is home to Claudio, helps provide the inspiration for his stunning paintings, which form a visual spectacle to stand back and admire. We are privileged to have an artist such as Claudio who is respected and admired both in Ireland and internationally. 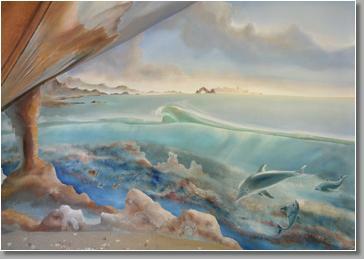 I have some of his paintings in London and Barbados and they are regularly admired.